Very few times a year do I get to see what people call a “blowaway” performance – a show so good, that the audience leaves with that artist in mind and ends up thinking about it for weeks on end. These shows are rare, but last week, I had the pleasure of witnessing the recently-signed Photo Finish/Republic Records artist Handsome Ghost give a blowaway performance at New York’s Music Hall of Williamsburg. Electro-folk act Handsome Ghost recently wrapped up their first tour, opening for MisterWives and BØRNS across the country. More or less the moniker for singer/songwriter Tim Noyes – though he claims it seems to be changing – Handsome Ghost blends the dark, indie/electro elements of Sir Sly with the lighter pop elements of Owl City (It’s an odd coupling, but listen to the band’s Steps EP and you’ll hear exactly what I mean). Handsome Ghost started turning heads last June when their enchanting song “Blood Stutter” became a Spotify sensation. The indie stardom landed them a contract with Photo Finish Records (The Mowgli’s, MisterWives) that brought them out to Los Angeles to work with Youngblood Hawke and 3OH!3 producer Matt Squire, and eventually led to a signing with UMG’s edgy Republic Records and a key opening slot placement on MisterWives’ “Our Own House” album support tour. Aside from appropriate bursts of applause, the audience was silent and unwavering through most of the set, bound as if by magic to Handsome Ghost’s ethereal music. The bar is set: If a deeper level of song craft and intimate performances like the one in NYC are their standard, then Handsome Ghost is unquestionably a need-to-know artist for 2015. Noyes’ performance is one in a million, and the songs come to life onstage with a chilling beauty. I was utterly blown away: Handsome Ghost’s performance still haunts me, a week later. I had the chance to sit down with Tim Noyes before the show to discuss some of the ins and outs of Handsome Ghost. 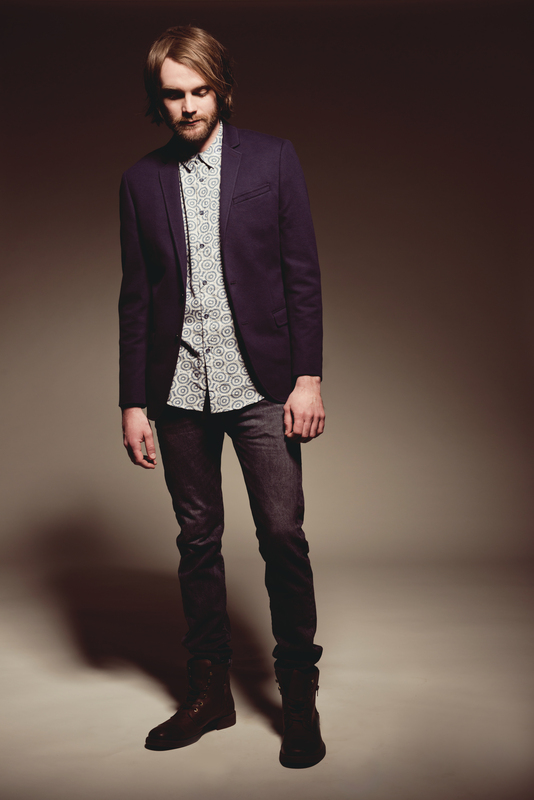 Read more about this emerging artist and his “electro-folk” genre below. 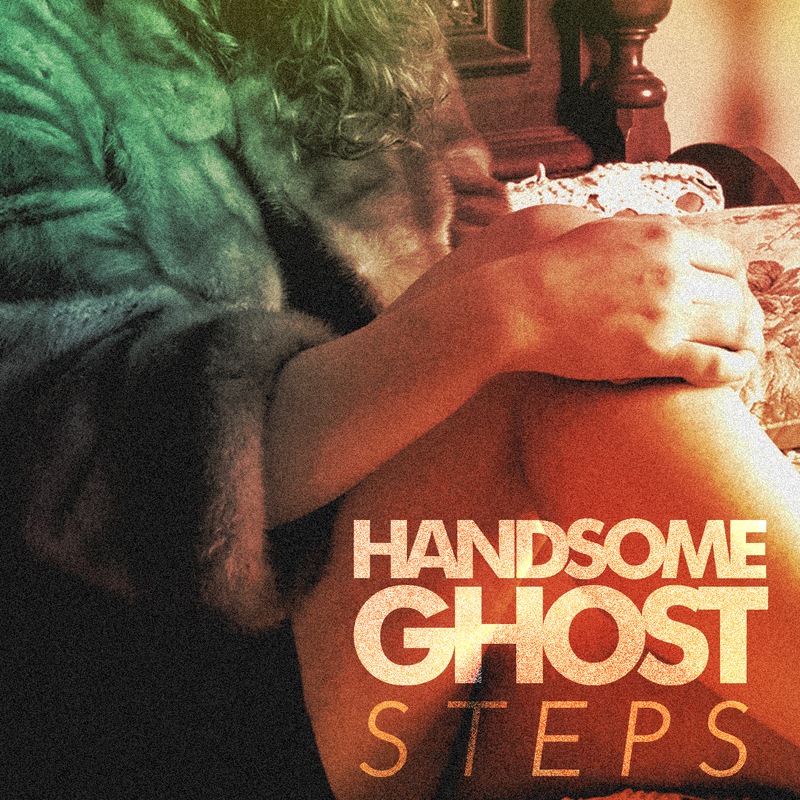 I’ve been listening to the Steps EP on repeat trying to figure out who you are and what Handsome Ghost represents. Tim Noyes: What it represents? How do you mean? Music-wise, it’s one of the most eclectic things I’ve heard all year. What was going through your head? TN: That was the goal, honestly. I think I was shooting for a unique blend of acoustic and electronic. I made a real effort to make sure the acoustic guitar, as well as some mandolin, a little ukulele – I wanted all that to shine through. I feel like it’s uncommon to have those two worlds colliding. I hope that’s what Handsome Ghost represents – a kind of common ground between the two genres. What about the emotions of the record? TN: At the end of the day, they’re all songs that I wrote on acoustic guitar, so there’s very much an emphasis on the lyrics and the melody. I feel like, the other way to do it is to build the track, and write the melody, write the words, etc… The times that I’ve done that, I find the emotion tends to suffer because it’s not what the entire song is built on. So I like to start with acoustic guitar, and just build from there. I’m from the folk background, so it’s still songwriting at the end of the day. I think I was shooting for a unique blend of acoustic and electronic. Are there demos of the “Vermont Demos” going back to you and an acoustic guitar? What was your experience working with producer Matt Squire? TN: Matt Squire is a very unique man in the way he works – which I learned to love. We’d be working with his assistant Steve, and Matt would step out for an hour or two, come back, pop his head in, give an amazing suggestion, and then he’d be out again! He just has a different pace of work, but yeah – it was collaborative, he was very respectful of my ideas, and of not stepping on the songs that I had already spent quite a bit of time fleshing out. I think that Matt was the missing piece, at the very end, to take the songs to where they needed to be. So there was a point in time when Handsome Ghost was just Tim Noyes, but you wouldn’t say that anymore? TN: Yes and no. At the end of the day, it’s still my project. Being a bit of a control freak, I like to know that. But with the live show coming together now, and taking part in our first tour, it seems like it’s moving in a more collaborative direction – at the very least, for the live aspect. [Handsome Ghost synths player] Eddie Byun, whom I’ve been playing on this tour, has proven himself to be a very talented guy, so I’m curious to see what our work will look like together, if we do some tracking or writing, or anything along those lines. It’s hard to give up your work or control, but sometimes it can be really productive. Do you consider yourself a singer-songwriter? TN: I do, at the core of Handsome Ghost, but I definitely do not consider Handsome Ghost to be singer-songwriter music. That’s understandable - differentiating the artist from the writer. TN: It’s much more to me than a guy with a guitar, but that is how the songs began. So I don’t consider it that, but I do consider myself a singer-songwriter, yes. TN: – No electric guitar. TN: I love electric guitar, but I want there to be a nice balance between the acoustic and the electronic production. If you bring in an electric guitar, it dominates the acoustic elements. That’s a rule I made right off the bat. It also helps that I don’t play much electric guitar, so it’s not like I’m itching to solo over the songs. But that’s been a rule that I’ve stuck to, and at least for the time being, I’m going to keep at it. Onstage I’m on vocals and the acoustic, and then Eddie plays eight instruments at once – something like that – so it sounds bigger than two guys. At least, I think it does. It’s much more to me than a guy with a guitar. What was in your head, going through your mind when creating this music? What were your influences? TN: My former band (of several years) was slowing down. I spent a summer subletting a place in Greenpoint, and I just started recording some songs and didn’t worry about being “folk” – you know, there are so many rules about what makes folk music “folk music.” I started to play around with the production, and I loved it so much – it was so fun! That’s typically the kind of music that I’ll listen to, so once I started I knew I needed to do this. Handsome Ghost wasn’t Handsome Ghost at that point, but that’s where it was born. I don’t honestly have anyone I can point to as a direct influence for when I made the record. What I will say that I have been learning a ton from BØRNS and MisterWives, and I mean that. I love their music, but I’ve been trying to study Garrett [of BØRNS] and Mandy [of MisterWives] and the way that they write, and I just think they’re so talented. I’m writing the next group of songs now, and I’m hoping that this education experience will prove to have been helpful. What was your reaction to a demo getting so much pickup? TN: Ugh, that was amazing! Very cool – I was extremely surprised. I think it got ten thousand plays on the first day, and I was like, “Oh my god!” It’s up around 8 million now, which is just unbelievable. I love Spotify – I need to get them all a gift for being supportive of the band; I’m very grateful. What might people be surprised to hear about Handsome Ghost? TN: I think they would be surprised that we are the most regular dudes you will ever meet in your entire life. Eddie and I have pretty much talked about exclusively sports for this entire tour. You were an English teacher before this? TN: Yeah, I taught in the Bronx for a few years, which was great! It was English as a second language… I think my biggest takeaway from teaching was the kids. It was a tough neighborhood and a tough school, but it was an incredible feeling to see the kids make it. Getting a kid to graduation was an unbelievable feeling. So you were already in a tough environment. Not that one can dutifully compare the two fields, but the music industry also requires thick skin. TN: Yeah, absolutely. There are definitely some parallels there – just do your thing, and don’t worry about it. The Steps EP has been out for one month, and you said your mind is already onto the next thing? TN: Yes, it is. The tour has been amazing, but I’m really looking forward to a few weeks to write. I’ve been trying to find time to write, here and there, over the course of the tour, but it’s just been impossible. I’m looking forward to full, open days – but I’m really happy about the feedback we’ve been getting from the EP. The MisterWives and Børns fans have been really sweet to us, and we’ve found a way to connect. I’m really excited for the future. So what about the blood imagery? TN: Those songs were actually written years apart, which is funny. “Blood Stutter”… I don’t know, I just loved the image that conveyed, and “Bloodshot” is my oldest song, and I can picture the summer of what the song is about in my experience. But there’s not a super serious ‘blood’ focus, it’s just two songs that happen to center around gruesomeness. How did you come up with the name 'Handsome Ghost'? TN: When the band was just beginning to come to fruition, we had, at the time, some extremely affected vocals that have since progressed in a different direction. But hearing them back on the speakers for the first time, a friend of mine was like, “Oh, that sounds like a ghost.” And I was like, “A handsome ghost.” (laughs) So we just settled on that. What's the goal of Handsome Ghost? TN: I just want to keep making Handsome Ghost records. If I can keep making Handsome Ghost records for the foreseeable future, I will be a very happy man. That’s my one goal; everything else is great, but that would be fantastic. What do you think is the role of the musician in society today? TN: To entertain, and at least personally, to make you feel a little something. That’s a really tough one; I think it’s up to each individual listener, but my hope is that, if someone hears a song of mine, they can connect with it, and it gives them some kind of feeling and emotion. I can write you an essay about that later. What can people expect to take away from a Handsome Ghost show? TN: This is our first tour, so we’re kind of developing that. What can people take away? We’re going to… put it out there. It’s a very emotional set. I think the live show is true to the record, in that it’s emotional and ethereal. Hopefully you leave the show feeling some connection to us and to the songs.